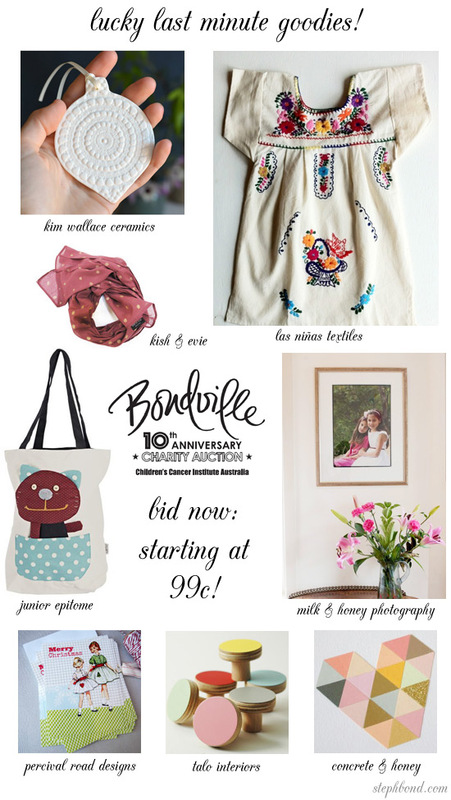 If you've been keeping an eye on the Bondville Charity Auction this week, you might not have noticed the last of the contributions from Australian designers and online stores that have been uploaded in the last few days. There's a little something for everyone - from a whopping $750 family photo session from Milk & Honey Photography in Sydney, goodies for Mum and kids, stationery, sweet artwork, the most gorgeous and delicate ceramic Christmas ornaments from Kim Wallace Ceramics and those delicious wooden knobs that I desperately want. Head over to eBay to bid now! I'm so proud to let you know that the total value of contributions from Australian designers and online stores is $9,803.19!!! You can find all the items on offer (all 104 of them) on the Bondville Charity Auction page. Bidding finishes early Monday, so head over and bid now! All proceeds go to the Children's Cancer Institute Australia. You've got to be in it to win it!